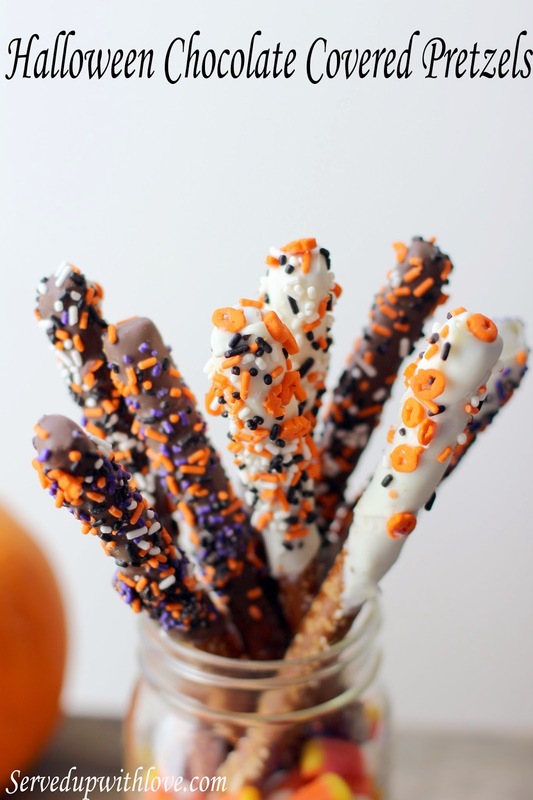 Who doesn't love chocolate covered pretzels? I am more of a fan of the white chocolate ones myself, my daughter prefers the chocolate ones. Maybe it's the sprinkles that make them so attractive. I love the salty and sweet combo. 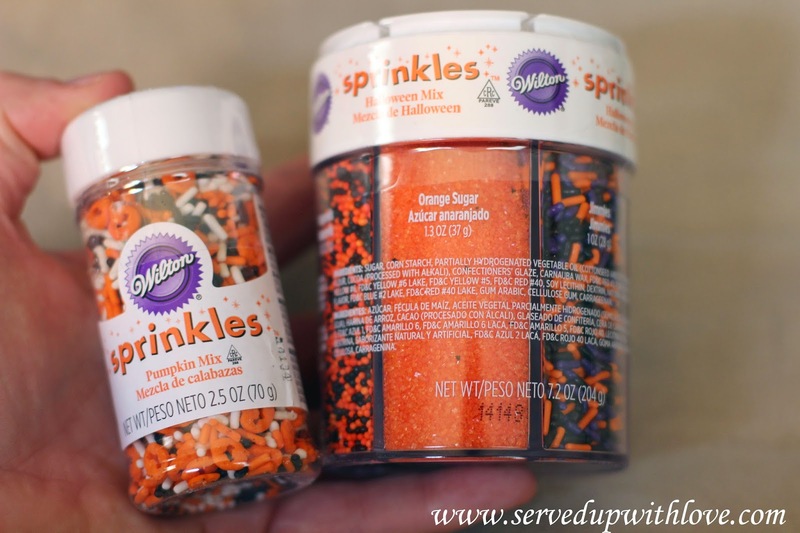 I had bought these Halloween sprinkles back in August at Party City at a really great deal. Both of these were $1 each! I just knew that had to be a mistake. I grabbed a couple each and when I checked out I made sure to ask how much they were. My Mom was with me and she said there was no way that was right. I was in total shock when it came up $1 each. I am kicking myself for not buying them out that day. I didn't want to "forget" to make sure of price and pay way too much for them and not realize it. There were only a few more left so I didn't miss out on too much right? Seriously, this is super easy to do. 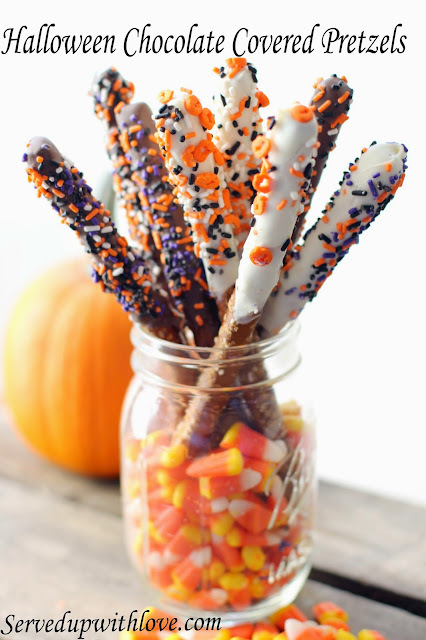 You could also use this same idea and make the smaller pretzel twists. I like to do them for Christmas gifts too. In fact, I may do some for teacher gifts this year. These can be made for any holiday, school function, bake sale, or any birthday party themes. Melt the almond bark in a heat proof container in the microwave. Please follow manufacturer's instructions on the package for melting. I used glass measuring cups to melt in and placed them side by side in the microwave. Once melted, dip the pretzel rod into the melted almond bark. Drip off excess before adding sprinkles. I held the pretzel over a paper plate to catch the runaway sprinkles, Place upright in a coffee cup until hardened. Use crumpled paper, paper towels, or anything sturdy to hold the pretzel rods away from each other while hardening. You can lay them on wax paper but they will have a flat surface. I use the excess sprinkles on the last of them so they didn't get wasted. 1. Bigger sprinkles will be heavy on the melted almond bark. May need to let it set just a bit before adding. 2.The chocolate almond bark is a little more "runny" when melted and you may need to let it set a little before using sprinkles. 3. Almond bark will separate if there is any water present. Make sure all containers are free of any moisture.